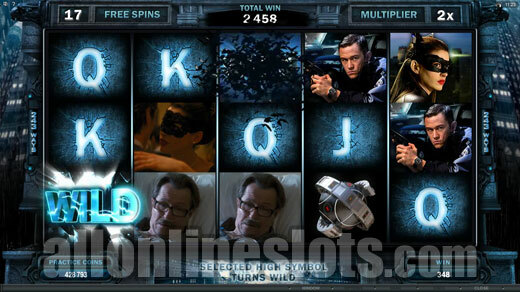 The Dark Knight Rises follows on from the success of the original Dark Knight slot machine from Microgaming. This time the game is not progressive and features a range of free spin bonuses with a potential 1,780,000 coin top prize. 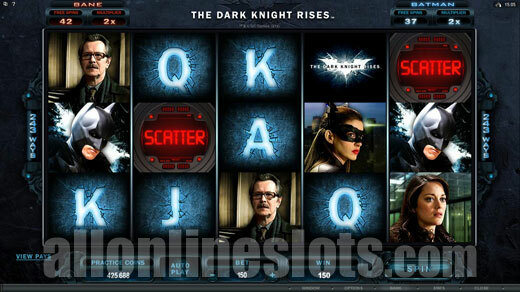 The original Dark Knight video slot from Microgaming is one of the most popular online slots of all time. 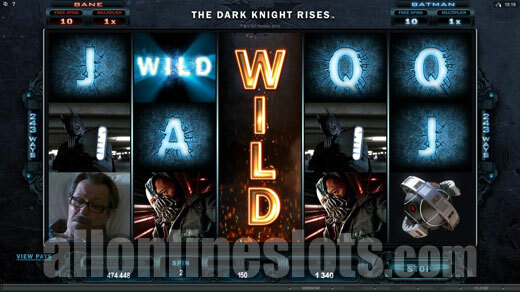 Microgaming have now followed this up with The Dark Knight Rises - a video slot based on the third and final film of the Dark Knight series starring Christian Bale as the Batman and Tom Hardy as Bane. 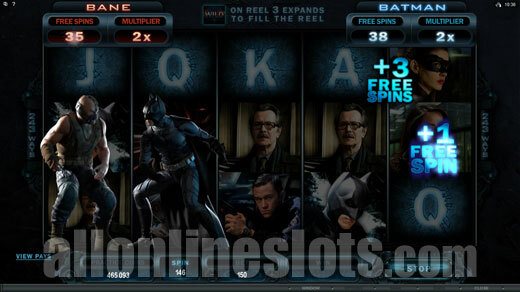 The game sticks with the 243 ways format used by the original Dark Knight slot although this is about where the similarities end. 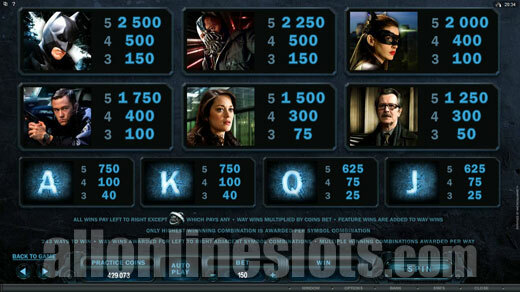 Instead of having access to the million dollar plus jackpots of the Mega Moolah network, The Dark Knight Rises is a stand alone game with a non progressive jackpot of 1,780,000 coins. On the base game the highest paying symbol is the Batman logo which is wild and substitutes for everything but the scattered Bombs. 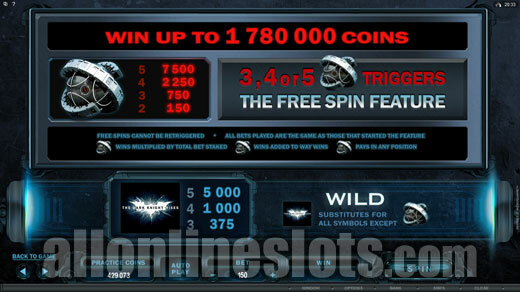 Getting five wild symbols pays 1,000 coins or 5,000 coins if you're playing the max bet of 150 coins. Unlike the original game the wilds are not stacked. During the base game there are two special features. The first is an expanding wild symbol which appears on the middle reel only. This wild can give you some big wins as all five of a kinds are paid three times. 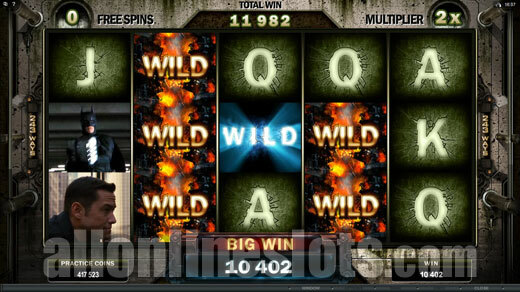 Combine this with wild symbols on the other reels and you can win multiple pays on a lot of ways on a single spin. The second feature available on the base game is the new "Symbol Scramble". This feature can occur on any non winning spin and shifts the current symbols on the screen to form the best possible positions for all symbols. While it is a new feature you are not going to win big with this bonus as the best possible wins are four of a kinds. At the top of the reels are two meters which show the Bane and Batman free spin totals. These totals start at 10 spins with a X1 multiplier. At the end of any spin the fight mode can be triggered which shows a fight between Batman and Bane where extra free games and multipliers can be added to the respective totals. To trigger the free games you need to get three or more of the scattered Bomb symbols anywhere on the screen. Once triggered you move to a selection screen where you can choose to play either the Batman or Bane free games. After 10 feature triggers two additional options are unlocked giving you four different free spins bonuses. The free spins can take a while to trigger which is a positive as you can collect a lot of free games. During our review we got up to 45 free spins on one occasion. Unfortunately the multipliers seem a lot harder to accumulate with the best we saw being X2. On a lot of features we had a X1 multiplier which is a bit of a disappointment. Win free spins with cascading symbols. Each winning combination explodes and more symbols drop in to place. 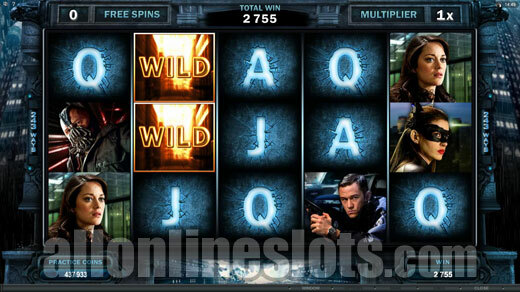 Available after 10 feature triggers, these free spins see super stacked wilds appearing on reels 2 and 4 which can lead to some big wins. You get to select one extra symbol to become wild. The extra symbol is wild for everything but the wild Batman symbol and the scattered Bombs. 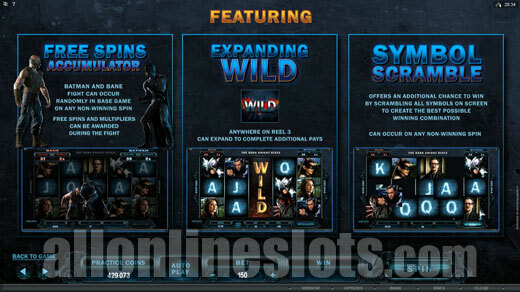 Available after the 10th feature trigger this bonus has extra wilds added to the reels 2, 3 and 4 after the reels stop. The wilds can split which pay all wins twice. The free spins can in our opinion be quite hit and miss especially if you only have the lowest X1 multiplier. If you manage to get the maximum X5 multiplier with a lot of free games you can see some impressive wins but this seems to be quite uncommon. 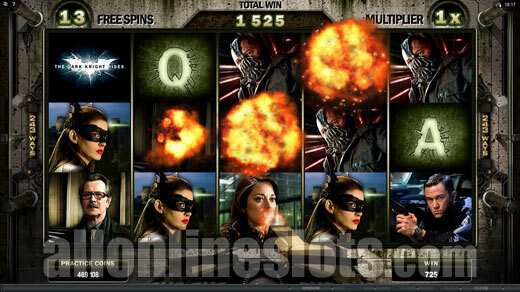 The Dark Knight Rises offers quite a bit in terms of free spin bonuses and extra features although it appears to be quite a low variance game where you will get a lot of small wins which keep you going while waiting for the bigger hits. We would have like to see at least a X2 multiplier on all free spins as X1 offers no real chances at the bigger wins. Microgaming may have fallen into the age old problem of the sequel not living up to the original. In our opinion the original Dark Knight slot is far better than The Dark Knight Rises which is a bit of shame considering the strength of the Dark Knight franchise. That being said it is still worth a look if you are fan of the series.